Alert falcon fans may notice that they are only seeing two young falcons. One of the males took the plunge late in the day on May 31 after much prompting from his mother, Rebecca. His flight was short and he landed on the mall. Many thanks and appreciation for falcon fan JoAnn who found the fledgling when she left work and took the time to get him in a box and wait until I arrived. 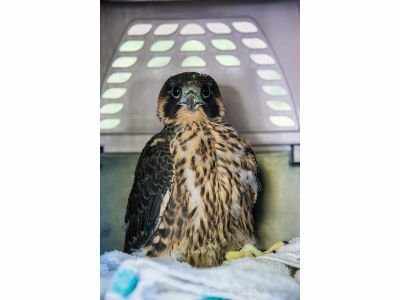 Kudos also to Peregrine Patrol member Andrea who saw the youngster take his first flight and spent much time looking for him, unaware that Joann was sitting nearby with the young bird in a box! The effort, time and concern from both individuals was stellar. The young male does not appear to be hurt and will spend a few days in rehab to get some experience flying before returning home for his next, and hopefully, more successful free flight. We have two more young falcons to get launched and hope they are both strong flyers. Rebecca is certainly encouraging them to join her in the sky although a few more days of practice flapping to strengthen those wing muscles would be good.